Melt the chocolate and butter over a double boiler. Once melted, set aside and keep warm. Place eggs and sugar into a bench top mixer bowl and whisk mixture until pale. Reduce the speed and slowly add the chocolate and butter mixture. Once fully incorporated, remove the bowl from the mixer and fold in the flour. Pour into a deep tray lined with baking paper. Bake for 20 minutes. Place a skewer into the centre of the brownie mixture to check it is cooked. If skewer comes out clean, it is ready. Remove from the oven and allow to cool. Place the brownie into the freezer. Once frozen, demould from the tray, place onto a board and portion into small discs of about 4 cm in diameter with a ring cutter. Place sugar into a heavy based saucepan and heat until it becomes caramel. Shake the pan rather than stir to avoid it from crystallising. Heat the cream separately and once dry caramel is made, add the cream slowly while stirring. Be careful as it might splatter. Once fully incorporated, bring to the boil until 120 C is reached. Then add salt, milk chocolate and gelatine and mix thoroughly. Allow mixture to rest for 10 minutes. Pass the mixture through a fine sieve into a disposable piping and tie the open end of the bag. Allow the caramel to set for at least 4-5 hours, or overnight for best results. Place hazelnut, almond praline paste, pumpkin seeds, salt and feullitine into a benchtop mixer bowl. With paddle attachment, mix the ingredients until uniform. Slowly add the chocolate until fully incorporated. Line a tray with baking paper, pour on the mixture and spread evenly to around 3 mm-4 mm in thickness, allow to set at room temperature. Once set, cut out the amount of discs required with a 4 cm ring cutter. Keep aside ready for next step. Pour cream and 75 g sugar in benchtop mixer bowl and whisk until it forms soft peaks. Place bowl into fridge until further use. Place 50 g sugar and the water into a heavy based saucepan and bring to boil. In the meantime, place egg into mixer and whisk until pale. Once sugar reaches 121 C, pour slowly into the whisking egg in a single, constant stream. Add bloomed gelatine to the pan that was used for the sugar syrup and allow to melt fully. While melting, add the melted chocolate into the whisking sabayon, making sure it is not cold. Then add the gelatine and whisk until uniform. 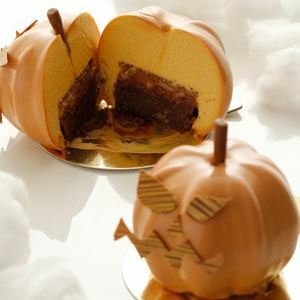 Fold the pumpkin puree and cream through the chocolate mixture and pour this mousse evenly into pumpkin-shaped moulds or moulds or your choice. Place eight brownie disks onto a tray, pipe some of the milk chocolate salted caramel on top, then place a disk of the pumpkin seed crunch onto the caramel. Press the layers into the mousse with a pallet knife, scrape excess from the mould. Place moulds into freezer and allow to set for at least 24 hours. Demould the pumpkins when ready to glaze. Place sugar, glucose and water into a heavy based saucepan and bring mixture to the boil. Remove from stove and allow to cool slightly. With a stick blender, blend until uniform and adjust the colours if needed. Spread chocolate evenly over a guitar sheet, or sheet of acetate. Once partially set, cut out shapes using a toothpick or skewer to make faces on the pumpkins. Allow chocolate to set overnight. Once set, carefully remove and place the decoration on the pumpkins to make faces. For the stems, set some of the chocolate in thin straws and allow to set overnight. Remove from straw and with a heated knife, shape stems to suit. Press stems in where toothpick had been inserted.